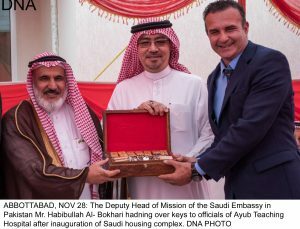 ABBOTTABAD, NOV 28 (DNA) -Within the framework of the developmental and humanitarian programs funded by the Saudi Fund for Development in Pakistan through the Saudi Arabian grant of SR 600 million, the Saudi housing complex was inaugurated at Ayub Medical and Teaching Institute, Abbottabad. 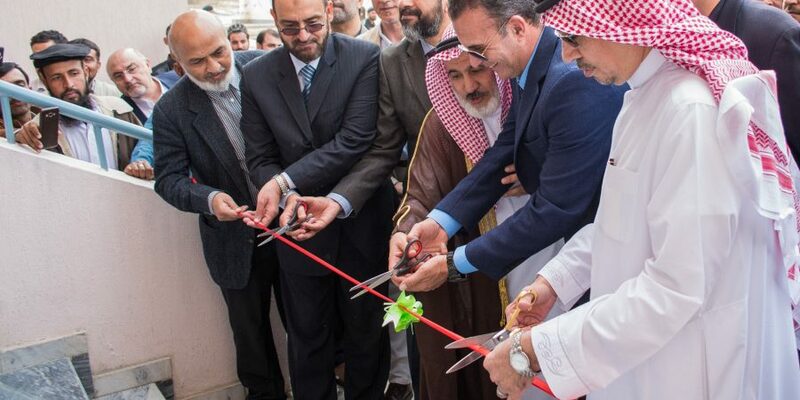 The Ambassador of the Custodian of the Two Holy Mosques to Islamic Republic of Pakistan, Nawaf bin Saeed Al Malki, said that the inaugurated project was is a grant from the Saudi Arabia Government, through the Saudi Fund for Development to our brothers in Pakistan. The complex consists of 19 buildings each building have six Apartments, with a capacity of 456 people, at a cost of about (10.5) million USD. He added that this project is one of 31 projects to be implemented from the grant. 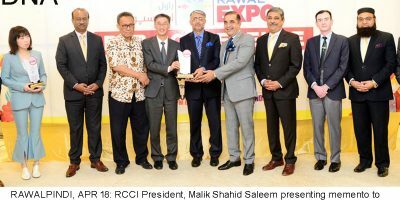 These projects will be followed by other projects, by Allah willing, which will be implemented through the Saudi Fund for Development from the second grant of 375 million Riyals, including the construction of a hospital in Islamabad, consisting of 200 beds at a cost of $20 million And another project is the construction of 8,000 housing units in the Baluchistan region at an estimated cost of about $ 26 million. 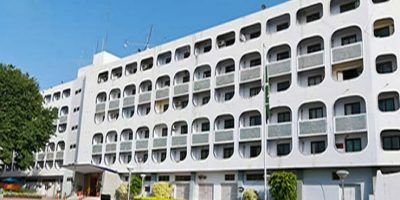 The Ambassador stressed that these projects are part of the humanitarian role played by the Kingdom of Saudi Arabia under the directives of the Custodian of the Two Holy Mosques King Salman Bin Abdul Aziz Al Saud and the Crown Prince Mohammed bin Salman to support the needs of the brotherly people of Pakistan. The opening ceremony was attended by Eng. Abdullah Bin Mohammed Al Shuaibi, Regional Director, Operations Department, in Saudi Fund for Development, representing by the Vice President and Managing Director, Dr. Khalid Bin Salman Al Khudairi, and the Deputy Head of Mission of the Saudi Embassy in Pakistan Mr. Habibullah Al- Bokhari, senior officials of the Pakistani government, and representatives of the Ayub Medical Complex. For his part, Director General of Earthquake Reconstruction and Rehabilitation Authority, Brigadier General Aftab Qureshi expressed his thanks and appreciation to the Kingdom of Saudi Arabia.